When Team Avatar return to Earthen Fire Industries, the factory owned by Toph's father, they find that the once small town is now booming, yet a strange mood hangs over its residents. When Aang is asked to join a business council meeting, the reason becomes clear: a massive bender versus non-bender conflict is threatening to turn violent. 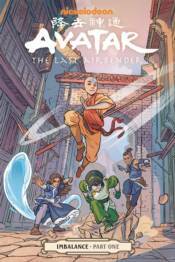 Written by Faith Erin Hicks (The Nameless City) and drawn by Peter Wartman (Stonebreaker), in collaboration with Avatar: The Last Airbender creators Michael Dante DiMartino and Bryan Konietzko, this is the ultimate continuation of Avatar!